I come from a long line of strong women who lived full, active lives. My grandmother, Nanny, was a woman in constant motion. She lived to be 95 years old, and I think she would have made 100 if my grandfather, the love of her life for 71 years, was still living. I vividly remember her gardening–not just planting flowers, but also planting, harvesting and canning an amazing variety of vegetables and fruits. She was always on the move, so much so that I don’t ever recall seeing her sit still for longer than a few minutes to enjoy a well-earned cup of coffee! Her mother—my great-grandmother—lived to be 97. She was also very active and physical. She came to live with us when I was five. She made sure my sibs and I spent plenty of time playing outdoors. She was a relentless drill sergeant. She believed in the power of physical activity. “People are more likely to rust out than wear out,” she once told me. As a young girl, I didn’t fully appreciate what she meant. But today, I understand completely. I know she was right, and science is now confirming what she knew way back when. 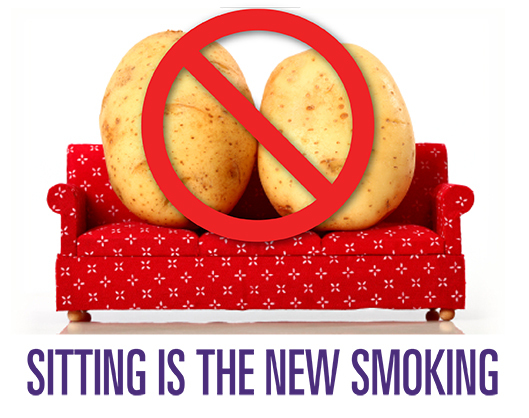 Growing evidence suggests that “sitting is the new smoking”….as in, you do it, and you’ll suffer the consequences. And those consequences aren’t pretty. In fact, chronic sitting and inactivity can be life-threatening. The Washington Post recently featured a story headlined “The Health Hazards of Sitting”, which identified the price we pay when sitting nearly eight hours per day, including heart disease, over-productive pancreas, colon cancer, soft abs, tight hips, poor circulation in legs, soft bones, strained neck, sore shoulders and back, inflexible spine, and disk damage. So what can we do to increase our odds for healthier, longer lives? We can all do what my grandmother and great-grandmother did. They stood more than they sat. They moved when they could have just as easily stood still. They spent a lot of time on their feet serving others. They enjoyed physical activity, and they reaped the rewards of long, active lives. We can all do what they did. We can all learn to MOVE MORE! I make a conscious effort to be less efficient. That’s right: less efficient. And I mean it when I say “conscious effort”. It isn’t second nature to me. It isn’t a genetic tendency, even with the genes from Nanny and her mom. I have to practice what I’m preaching!! So, I park in the first spot I see, rather than circling the parking lot for a spot closer to the store. When I’m on a phone call at my desk, I stand and pace. I put my trash can on the other side of the room so I have to get up from my desk to throw things away….you get the picture! Dozens of times every day, we each make choices about how active we will be. If you and your work associates are having a meeting, for example, you can make it a “meeting in motion” and discuss the business at hand while walking as a group. You can take the elevator instead of the stairs. Instead of fast-forwarding through commercials while watching television, try using those breaks to stretch or walk in place. Over time, you’ll begin noticing changes in how you feel. These seemingly small steps will add up to big results, and can positively impact your health and longevity.